We have all experienced it. You buy a bunch of bright green fresh basil or parsley at the supermarket on Sunday and by Wednesday, it's all wilted and brown. That's why I'm pleased to introduce you to Daregal Gourmet Herbs, a company specializing in fresh frozen herbs. That's right. Fresh herbs are chopped, washed, and packaged in user-friendly containers. 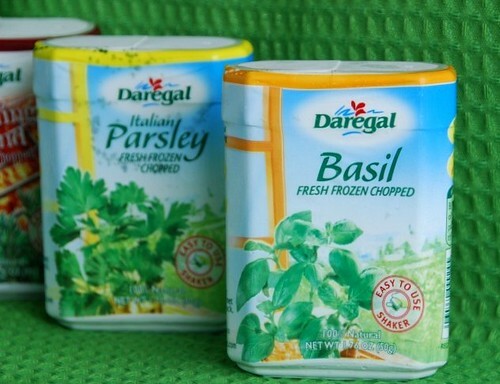 Daregal offers basil, parsley, cilantro, dill and oregano as well as three spice blends. Just tell me what your favorite herb is by the end of the day Saturday, December 20, 2008. That's it. Two winners will be randomly selected and announced in a future post next week, so please check back. 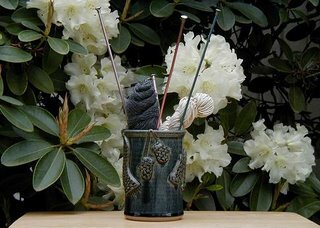 Don't have a blog? Just leave an active email address where you can be reached. Also, winners will need to provide their real names and mailing addresses. My apologies to my international readers, but given the nature of the prize, winners will have to be limited to US residents. My favorite herb is rosemary. My email is pxilated at gmail dot com. I love cilantro. Spices up salsa and give zing to curry. Actually my favorite herb is Tarragon, but I wouldn't mind to win all four of this herbs. Oregano and cilantro. I love Mexican food. No contest - cilantro. It's essential for our homemade guacamole! Hands down my favourite herb is basil. Every kind of basil imaginable makes it into my dishes!!! Basil is definitely my favorite fresh herb to eat. Rosemary is my favorite herb to smell and use as an oil. And oregano is my favorite dry herb. What a great way to get fresh taste! My favorite herb is Rosemary. Maybe it's because it's the last one in the herb garden every year, but I LOVE the earthyness. My favorite herb?.. ANY! So much Flavor! But.. Basil and Chives are my most fave! It's probably rosemary. Or cilantro. no wait! basil. I don't know. I like them all. I enjoy cooking with all herbs. Dill is my favorite. My fave is Cilantro. I love the smell, too. Gosh, I love so many herbs... I guess my favorite would have to be rosemary. I've never heard of the frozen herbs... if I don't win, I'm going to have to buy some and give them a try! I love dill and chives! Basil, no doubt about it! Definitely cilantro for me! I LOVE it! Basil and rosemary are the runners up. Hmmm... I think it's a toss-up between tarragon and dill. Gosh...usually my favorite herb is the one I'm using at the moment to make a scrumptious bit of something. I use a lot of oregano and rosemary...great for different meats! Tough to decide Susan. I adore rosemary & thyme, but cook so much using basil. Happy holidays! I LOVE dill--for some reason I cannot get enough of it lately. Could be a pregnancy thing but still. So Yummy! Parsley, hands down. It's my go to herb for flavor and for presentation. I keep a fresh bunch of parsley in a damp paper towel at all times in my fridge. After that, it's thyme. Basil, all the way. I live in an apartment, so I can't grow it the way I'd like to, but my mom plants 15 bushes every year and makes Pesto in the fall. When I open up one of the jars, it's like summer has arrived all over again. I am a basil girl but I grow it year round. What I hate buying because it wilts so quickly and would love winning is cilantro! My favourite herb is .... tough question but if I have to chose among my favourite which is mint, cilantro, oregano and parsley, I would say parsley because it's the one I cannot do without. My email is kjlaufer at hotmail dot com. What a great idea! My favorite herb is basil. I think my favorite herb is cilantro. It can be used in so many different recipes and I love its bright flavor! Its a tie for me between Basil and Cilantro. Both of which seem to wilt on me sooo fast. I would LOVE to win this! It's a tie between cilantro & basil. Looks like they're popular picks! Hmmmm, a tough choice...basil with cilantro as a very close second at our house! Cilantro for me ... necessary for yummy salsa. Here's an emailed entry I received. It's from Martha who loves cilantro. I couldn't live without basil! Just the smell of it puts me in a good mood! My favorite herb is probably lavender! I love the smell of it. Oh Parsley is definitely my favorite....with Basil a close second! What a great item- I usually freeze my basil and parsley and chives right from the garden- it is so much easier. I'll have to join the crowd with basil being my favorite herb. I just can't wait for summer and the fresh pesto - Yum! My email is acmullins at gmail dot com. My absolute favorite herb is basil! Although rosemary is very quickly starting to catch up to it! I'd have to pick basil, followed by oregano. Cilantro! I love it, but unfortunately some almost always goes to waste when I buy it fresh. My favorite herb is basil. I love basil with tomato!!! Must have my pesto: Basil. Rosemary is a close second. so difficult! i'll have to go along with the masses and declare cilantro and basil as my favorites! *Rosemary* is wonderful with olive oil and garlic on pretty much everything! Basil wins as my favorite herb, hands down! My e-mail address is emlawton13@yahoo.com. Favorite single herb is cilantro; the smell at the store makes me swoon LOL. Fav herb mix is Bell's Seasoning, which no one where I live has ever heard of, but I bet you might have, since you grew up in RI, where my mother's from. I read that Martha Stewart used it when making stuffing with Jennifer Garner. How is the winner going to get frozen herbs delivered? I don't keep up on some things, and didn't know frozen things could be shipped. I can only pick one favorite herb?? I'd have to say rosemary because I use it the most...but I also love thyme, basil, and oregano. Yum! Peppermint is great! Heck I even use peppermint shampoo, hairspray, and body wash. Here's an emailed entry I received. It's from Corliss who loves cilantro. Basil, hands down. I love just eating basil with crackers in the summer. It's so refreshing!